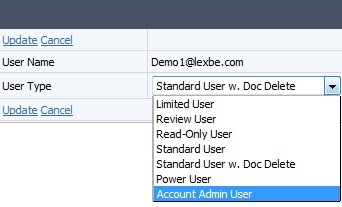 We regularly add new functionality to Lexbe. One of the advantages of the software-as-a-service (SaaS) model is that we can make ongoing improvements without requiring users to download and re-install software. •Review User. This is meant for reviewers and do not allow changing ‘metadata’ fields. Review Users can only see the Browse, Search and Document Viewer pages. Report Hyperlinks: When you finish uploading batches of files, this feature will allow you to go from the Upload to Case Assessment pages, and generate reports based on different options such as 'Doc Count By Master Date', 'Doc Count By Extension', 'Doc Count Unsupported by Extension', and 'Doc Count Failed To Convert by Extension'. For example, if you click on the option 'Doc Count By Master Date', the hyperlink will take you the take you to the Case Assessment page and display a report showing the file count based on the 'Master Date', which is the field that captures the main date and time an email family was sent (email and its attachments) or for non-emails the last date modified or the date created (if date last modified is not available). Auto Advance & Propagate Coding - How Do They Work? 1- Use the 'Save' Button. Code the current file, and just click on the 'Save' button. Please note this command will only save the tags applied (e.g. 'Responsive', 'Confidential', etc. ), without moving to the next document. 2-Auto-Advance (check-box): If you want to move to the next documents automatically, then you need to select the 'Auto-Advance' check-box. This option lets you review, code and advance to the 24 subsequent documents in list. After 25 documents, close the current window and return to the Browse or Search pages. Advance a page at the bottom of the main table, and then click on the first document in the page to open the document viewer to proceed for the next 25, etc. This feature will give you the ability to execute searches and build review efficiently, especially when you have a team of reviewers that will be added as users within your account in order to review large set of document organized. If you are an Admin User and want to create Review Sets, please click here. For users reviewing sets of documents, please click here. We just released our latest newsletter, covering our recent New Features & eDiscovery Best Practices. If you haven't received, please enter the email address with which you want to subscribed to our mailing list. We are working on adding new functionality to Lexbe. Some things may be done quickly and some may take a while. We generate our list of improvements and prioritize based on user feedback. Please let us know what you would like to see by contacting customer service at our Support Center or send us an email.